This page is about the lightsaber I built. It contains all the information needed for someone else to build something like it. 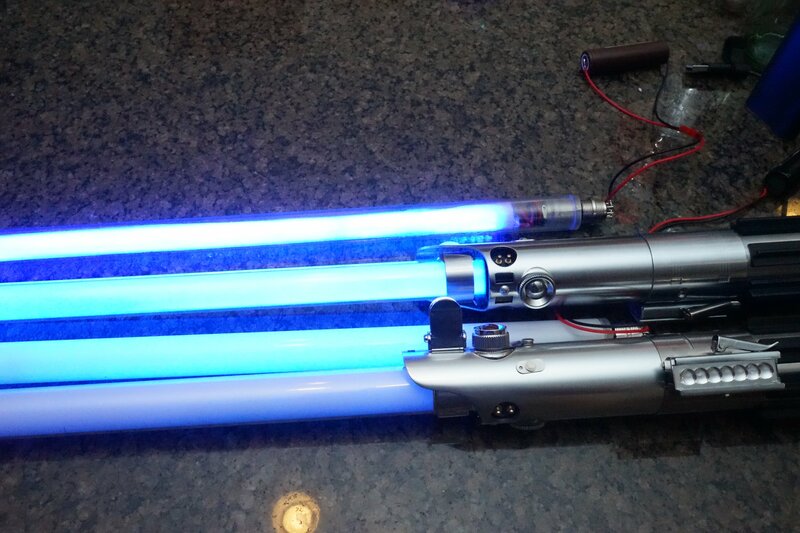 This lightsaber design is 100% open-source, supports a variety of blade types and and is built from easy-to-obtain materials. It is not a "reveal" type light saber since that doesn't really interest me, and because there just isn't any space left in the hilt. The build instructions is split out into several pages, which can be accessed by clicking the headlines below. 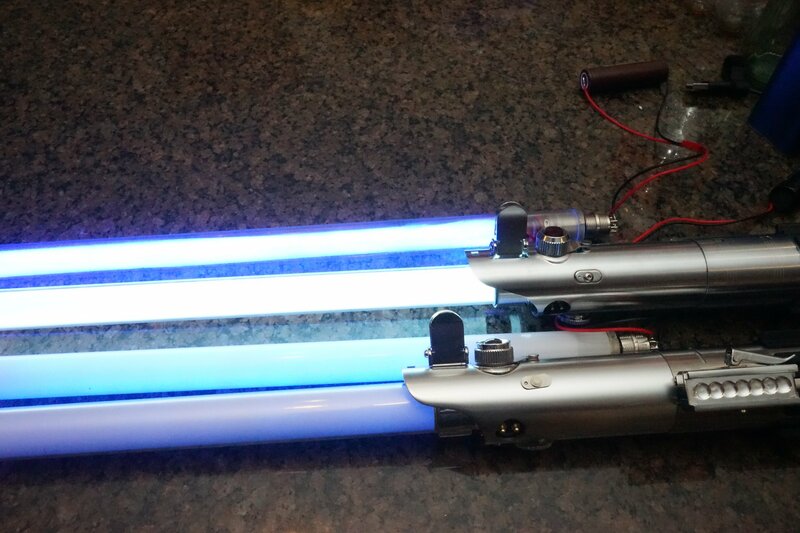 All-in-one STM32L4-based lightsaber electronics. It is small, feature-packed and 100% open source. This board retains all the features from the Teensy based designs, but are smaller and requires less work to put together. As always, all files and instructions to build these are provided, but it's probably easier to just buy one. The electonics is based on a Teensy 3.2. It's small, fast, easy to program and has lots of available libraries. Also, I picked it because it doesn't need an external chip to play audio, which makes latencies low and makes it possible to synthesize audio in real-time. Version 1 is bulky, but easy to make at home version 2 is a smaller, integrated solution which is harder to make. V3 is a minor improvement upon V2 with a 3W digital amplifier. All files and instructions required to build either one is provided, but for version two and three my recommendation is to find a place to buy it instead. The hilt I used is a Graflex 2.0, a prop made to look like the Graflex flash gun that was used for Lukes lightsaber in Star Wars. This hilt has very limited space, so if the electronics parts can fit in here, it can probably fit in other hilts as well. My saber doesn't have a "reveal" feature, where you can see some sort of glowing crystal if you open up the saber. I wasn't particularly interested in this feature, and there wasn't enough room for it. The software is open-source and can easily be modified to do anything you want. If you're not a programmer, I can probably add the feature for you, just contact me on the The Rebel Armory forum. The charging adapter lets you charge the battery in the hilt without opening the saber. It connects to the blade connector and has a regular 2.1mm jack at the other end to plug in the charger. Of course, you can just wire in a 2.1mm jack the normal way and skip making a charging adapter. All the blades below can be built and connected to the same hilt. This LED sits in the hilt and essentially works like a flashlight that lights up the blade. The blade itself is fairly simple and can be easily replaced if it breaks. The LED star can be a single color, color + plus flash-on-clash color, RGB or RGBW. Since the Teensy does not have high-powered LED drivers on board, external FETs or led drivers are required for each channel, which adds some complication to the build. LED strings are an array of LEDs throughout the blade. LED strings often provide brigher and more even illumination than LED stars, but if you break the blade, it's a lot of work to fix an LED string. String blades can also be made out of RGB LEDs, in which case they would be wired up the same as an RGB LED star. If you want to be able to change color and have the blade "scroll" as you activate the saber, the PL9823 string blade is a pretty good solution. It is build similar to an LED string blade, but has a control channel that lets you control each LED individually. Since the PL9823 LEDs have internal drivers, no extra circutry is needed to drive them. PL9823 LEDs are also called neopixels or ws2812-compatible. Currently, this is my favorite blade. Strips of LEDs can also be used, which simlifies the blade building significantly. However, because these LEDs are directional, and not diffused, it is difficult to make the illumination entirely even. Segmented string blades are now supported with the V2 electronics and V3 electronics, However, I heartily recommend using a WS2811-compatible string instead. On the left, all blades are blue, on the right, blade (2) is set to white, which makes it much brighter. These features are currently experimental, as I don't have any sabers which use these featueres. The PJRC prop shield was specifically made to support these kind of strips, and they have a much faster protocol than PL9823/WS2811/neopixels, so they would be far superior for POV-writing. However, they share a bus with the sdcard and flash serial chip, which could cause some problems, and also, I have not found any "slim" versions of these strips, which means that they are even more difficult to diffuse than the slim SK6811 strips I have used above. Personally I think these are silly, which is why I don't have any, but there is full multi-blade support, so it should just work. These pages should contain all you need to know to replicate what I did, or something like it. If you want to know all the gory details of other things that I tried, and things that whent wrong while I was coming up with the code, chassis and electonics design, go read my build log. Problems? Questions? Suggestions? Check out the fx-sabers online forum. This page has been accessed 31,072 times since July 25th, 2016.